With crucial delegate selection meetings beginning this week in the Alberta Progressive Conservative party leadership race, unite-the right-candidate Jason Kenney claims there is a movement underway to “infiltrate” the PC party to defeat him. 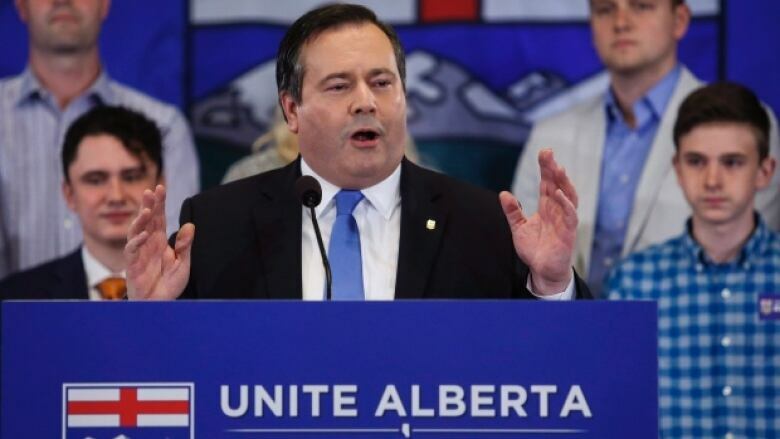 With crucial delegate selection meetings beginning this week in the Alberta Progressive Conservative party leadership race, unite-the-right candidate Jason Kenney claims there is a movement underway to "infiltrate" the PC party to defeat him. In an email statement sent to CBC, Kenney alleges he is the target of a social media campaign orchestrated by so-called "radical NDP activists." Kenney says it's being done to mobilize non-supporters to buy PC party memberships to influence the delegate selection process. "These are folks who are not interested in success of the free enterprise side of the political spectrum," said Kenney in an interview Monday. "They want to see continued division, because the only way the NDP can win the election is through vote-splitting between the Progressive Conservatives and the Wildrose party." It's the first time since 1985 the PC party will hold a delegate convention to choose its new leader. Starting Nov. 17, each constituency will choose 15 delegates to attend the leadership convention in March. Only delegates to the convention will be allowed to cast ballots for the new leader. It's a departure from recent PC system of choosing a new leader by the one-member, one-vote system. 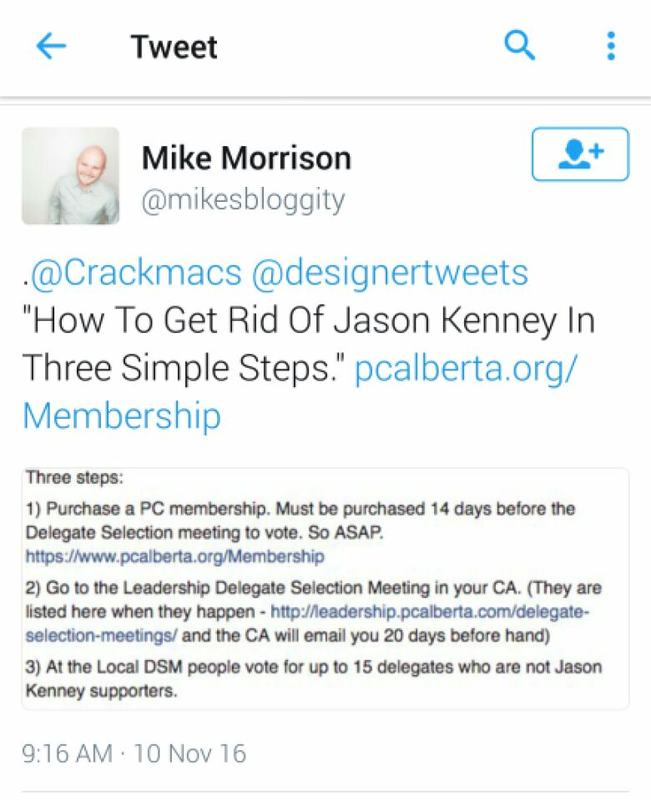 Kenney said social media posts detail, in "three simple steps," how to buy a PC membership, vote at a local constituency meeting, and influence the outcome. But the Calgary blogger Kenney singled out as an example of a so-called "radical NDP" activist behind the campaign said he is not a party interloper. Mike Morrison said he doesn't have anything to do with the NDP and first became a member of the PC party in 2011, then rejoined at the PC policy convention in Red Deer Nov. 5. While Morrison said Kenney's statements are "completely false," he readily admits he is trying to prevent Kenney from becoming leader of the party. Morrison said he is particularly upset by the actions of Kenney supporters at a recent Red Deer policy convention, where they tried to negatively influence the outcome of policy resolution regarding LGBTQ students and gay-straight alliances. But Kenney said there are some, such as Morrison, who are trying to influence the outcome of the leadership in the same way as labour organizations and other groups came out to support Alison Redford in her successful PC leadership bid in 2011. "Tens of thousands of NDP activists signed up as PC members to vote for her. Their plan worked," Kenney said. Morrison said he is only doing what Kenney has been doing since he first entered the race, but from the other side of the political spectrum. "He is the one asking Wildrose members to join the PC party," Morrison said. "So for him to send emails and spread blog posts about me, asking people to join the PC party, is ironic." When asked Monday during a news conference in Calgary if the NDP was infiltrating the PC leadership race, Premier Rachel Notley laughed at the notion, suggesting there are many other more pressing issues. "What we are focused on doing in our party is governing the province, understanding that we are actually facing very serious issues in Alberta that families are very concerned about, jobs, and job creation in the economy and their future," she said. "So our work is entirely dedicated to the best we can do for Albertans," said Notley.